I’m in Bermuda right now waiting to board the JOIDES Resolution drilling vessel (known as the JR) for IODP Expedition 342 (see this post for background on that). I arrived yesterday and we board the JR tomorrow, so I had today to myself to do whatever. There’s an extra day just in case of travel difficulties — spending an extra day here is not a big deal compared to literally missing the boat. 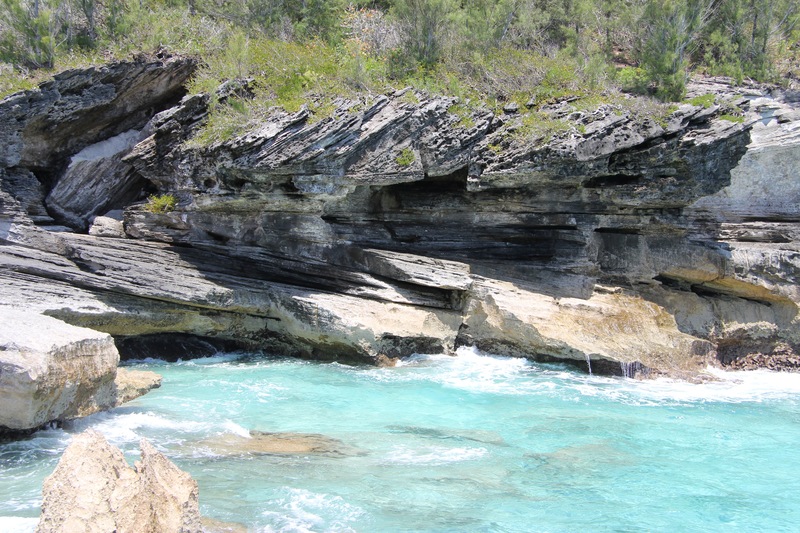 I spent a couple hours this afternoon at the Spittal Nature Preserve on the southeast shore of Bermuda. It’s a lovely little place with both coastal views and a trail through some woods near a brackish pond. It was peaceful and serene, just what I was looking for today. The photo above nicely shows the Pleistocene wind-blown dune deposits exposed along the coast. The material for these ancient dunes is all bioclastic (shelly material and pieces of coral reef) that was able to cement up quickly to become rock. Now this rock is weathering away and forming outcrops all over the island. You can see it in the building stone all over the place too. See this and a bunch of other photos from today in this Flickr set. My next post will be from the JR itself sometime in the next few days.